Estou aqui a tentar encontrar as palavras certas para vos apresentar o novo trabalho do russo Stanislav E. Rasovsky, mas na verdade não as consigo encontrar e por isso vou colocar a apresentação da própria GrooveCaffe e em inglês e tudo, porque é melhor explicação e apresentação para este Enfeeblement. Russian artist Stanislav aka. Irokez manage to presets us cinematic instrumental stories. 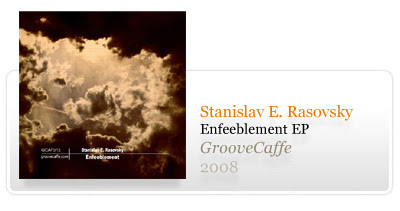 From beginning till the end of album Stanisalv firmly lead us trough his music escapades. Starting in a tuxedo manner, continued with melodic break-beat, album has it own tempo from lounged moments with jazzy sax to weird d’n’b atmosphere. His look back on trip-hop jazz downtempos with sounds mostly sampled, simply cuted and reunited in colourful sound pictures. Disjointed in layered melodic tunes, with recognizable concise arrangements, his music brings us circled tale of joys and pains, false and misconception in todays "modern life".